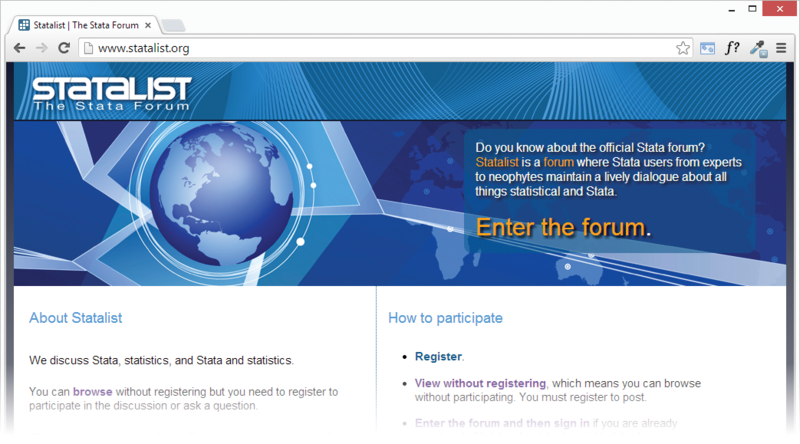 Stata News | Statalist is now a forum! » Home » Stata News » Vol 29 No 2 (2014 quarter 2) » Statalist is now a forum! Statalist is now a forum! Statalist is a discussion group for discussing all things Stata, and it has proven to be a great resource for learning Stata since 1994. Because the focus is on discussion, it has also proven useful for advanced users. On March 31, Statalist was moved from being an old-fashioned mailing list to being a modern, web-based forum. It’s better and, to use the modern jargon, it scales better, too. The old Statalist-the-mailing-list had 5,229 members as of last count and averaged some 47-plus posts per work day. It was Statalist’s very success that limited Statalist’s enrollment. Most people don’t want that many emails dumped on them every day. Statalist-the-modern-forum can go far beyond those numbers and only gets more useful. Statalist has always been and continues to be run by Stata users, although StataCorp set up the forum software and is running the servers for the new Statalist. Dr. Marcello Pagano of Harvard University has been Statalist’s moderator since 1996, and he continues in that capacity on the new Statalist. The original Statalist’s searchable archives are still available and will continue to be available; visit statalist.org/archives. They are a valuable resource for Stata users. But the most valuable resource is the new Statalist, and we recommend you try it out. You can join (for free, as usual) or you can lurk. We bet you’ll lurk awhile and then join. Among so many other reasons, Statalist is a great place to catch the ear of Stata’s development staff. All development staff are required to at least lurk, and most join. As E.F. Hutton’s marketing department was fond of saying, “When E.F. Hutton talks, people listen”. At Statalist, it’s the other way around. If you speak, we guarantee the development staff is listening, and they will respond. But as important—and often more important— is that other Stata users are listening and responding, too. Statalist is not just about reaching Stata’s developers. Most discussion is between Stata users—and highly competent ones at that. Statalist is a great place to learn how to get the most out of Stata. Pay Statalist a visit. Go to statalist.org.